Guess who rang the opening bell at the New York Stock Exchange yesterday? The picture above should give it away. That’s right, the evil Galactic Empire and the evil business empires of Wall Street have finally come to an agreement, and Darth Vader opened the trading day on Tuesday morning, flanked by an honor guard of Storm Troopers. Just pray Darth Vader doesn’t alter the deal further, otherwise you might find Steve Jobs and Bill Gates being Force-choked by a giant cyborg. 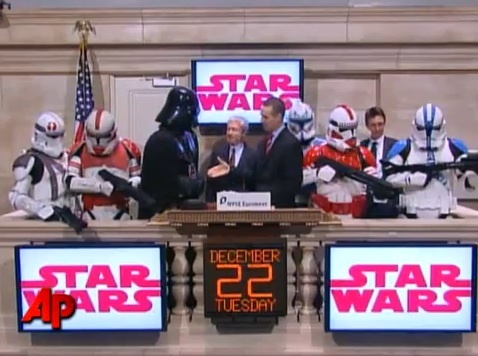 Now, why did Vader and the Star Wars gang make an appearance at the NYSE? I have no idea. Your guess is as good as mine. Maybe it was some sort of Star Wars anniversary, or maybe they’re promoting some upcoming cartoon, video game, or maybe one of the new television series LucasFilms has coming down the tubes. Either way, it makes for a cool image!